“The way I see it, on all real games, you’re trying to get across some idea,” Wynn said. “(Role Playing Games) try to get across various political struggles, or something philosophical. I think you’re always learning something in a game, even if it’s just combat and layouts. It’s always entertaining to have your opinions syndicated. 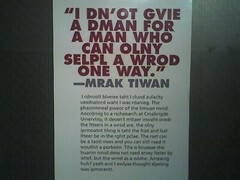 This poster reminds me of everything I’ve ever read by my friend Will. hahaha.